can you provide the dimensions (mostly just interested in the length) you had to work with across that back wall (the wall with the cooktop and the oven). and can you say how deep the spice drawers are? beautiful by the way. i about died when i saw this as its almost exactly what i've drawn up for our remodel that starts in a few weeks. The stove wall is 148" long, and the spice pullouts under the hood are 15" deep. Good luck! Crown Molding - What was used to transition from the hood molding to the kitchen crown molding? Thank you for your question. A crown block was used to transition the hood molding to the kitchen crown molding. Bar stools - Where can I find these exact bar stools? We r building a house. Thank you!! Thank you for your question, the bar stools is something that the homeowner would have purchased and therefore we would not have that information on file. Sorry we were not able to help but wish you the best on your project! I believe you can get these or similar from Target.com. They used to have a lighter version and a darker one like those in the picture. Where can I find the chandelier? Thank you! I am waiting on a response from the client, I will post the answer once I receive one. I know there is a similar style available at Lowe's. What is this countertop? Thanks! Beautiful kitchen. Thank you for the info! what is the kitchen paint color? Soft Chinchilla 2135-50 by Benjamin Moore is similar. I do not have that information on file, I can try to check with the client, and will post if I get an answer. This is a stunning kitchen!!! - Please can you share the cabinet paint color and what is the width of the hood? Thank you for your time! Thank you for your question as we appreciate your kind words. The hood width is 79" wide and the paint color is a custom white paint that is a part of our collection. The paneled door would have been supplied by the contractor so that is not info we would have on file to be able to give you. Islands length - Could you please tell me the dimensions of the island? Cabinet pulls - Beautiful kitchen! Do you know Where the cabinet pulls were purchased, and who makes them/brand? Thanks!! Cabinet pulls are manufactured by Schaub / #204-AP. Dimensions - Can you tell me the dimension of your hood? what are the dimensions of the dining area? I do not have the floor plan on file any longer - sorry. What color is the blue paint on the walls? This is a solid hardwood floor w/ a dark espresso stain color. Island - What color of glaze was used on the island? That particular color is our Chesapeake Bay finish from our exclusive Heritage Collection. It's actually quote an extensive process and is a painted finish. 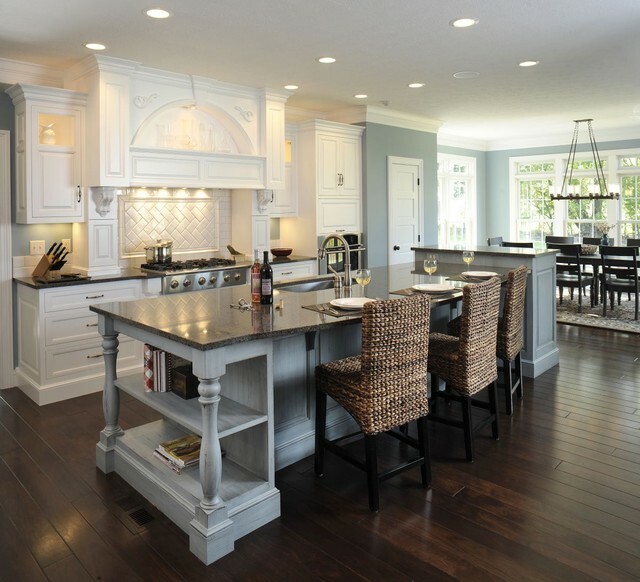 Island color - What color is the kitchen island or could you suggest a possible Benjamin Moore similar? This is called our Chesapeake finish, I'm not sure how it would compare to benjamin moore colors. Good luck! Blocks counter from living room.